There are many scenarios you may find yourself in where you are at risk for an eye injury. Whether you are playing a sport, handling chemicals, or in the way of any foreign objects you could find yourself dealing with an eye injury. Don’t worry - they are common and with the right information and care they are usually manageable and easily taken care of. 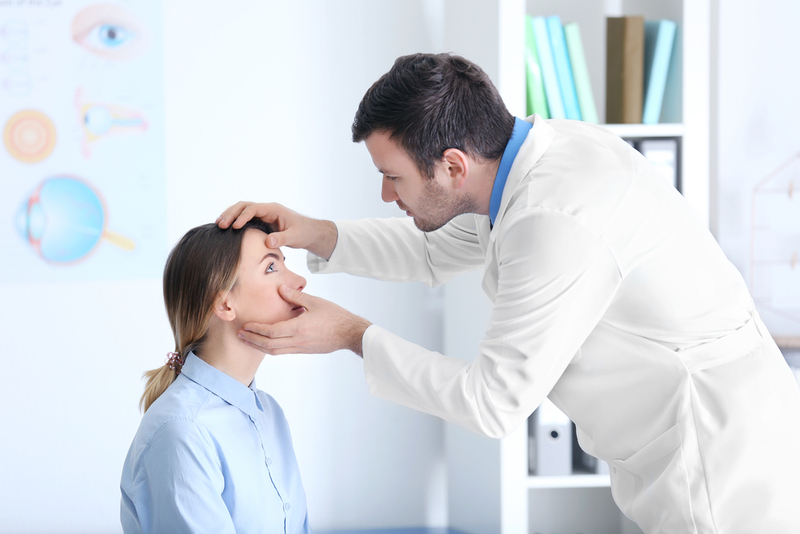 Here are 4 of the most common eye injuries and how you can prevent them! There are many things that occur that can leave you with an irritated, scratched eye. Whether its dirt particles that got into your eye, an accidental slip of a makeup brush to your eye or even a paper cut there are endless possibilities of what's to blame for your irritated eye. To prevent scratching your eye it is important to be extremely careful when handling anything around your eye and to protect yourself from an object that can cause damage to your eyes. If you think something may have gotten in your eye it is important not to rub or dig at your eyes. Instead try blinking or washing your eye with saline solution or clean water in an effort to get out what is scratching your eye. If you have scratched your eye it is important to call your eye doctor to get it taken care of safely and quickly. The next common eye injury involves substances or chemicals getting into your eyes and causing discomfort and damage. When you are surrounded by chemicals there is a chance that some of the substance could get splashed or sprayed in your eyes. It is important to protect yourself from chemicals and be cautious but if find yourself in this situation don’t panic. You should immediately rest your head under a stream of water (slightly warm) to try and wash the chemicals away from your eye. It is also very important to call your eye doctor or an urgent care center to see what they recommend as the next steps, make sure to tell them as much detail about the incident as possible including what chemical you’ve been exposed, how it entered your eye and how long ago it occurred. When playing sports, you are putting yourself at risk on many injuries. Especially injuries related to your eyes. It is important to take steps to reduce your chances of an injury by wearing the protective gear necessary. It is estimated that 90% of sports-related eye injuries can be avoided by wearing the correct protective gear. If you do find yourself in a situation where you have injured your eyes while playing a sport it is important to call your eye doctor to get an over the phone evaluation and figure out what the next steps are to treating your injury. Each sports-related eye injury is going to vary in steps to take and seriousness that’s why it is very important to treat every eye injury as an emergency at first. Now that you have learned more about different types of common eye injuries we hope that this will help you further protect your eyes and vision down the road. Some injuries are unavoidable and when you do find yourself in a situation like that give us a call so we can help you take the next steps towards healthy eyes!